Yesterday, for the first time in my life, I bought a season pass. 2011/12, I’m so ready for you. I’m ready not to be weak, not to be limited, to charge the way I did before the accident. The way I still can inside my head. I’m ready to go into the backcountry. I’m ready for anything, just not quite yet. I also bought my unlimited spring pass for this year. One more Edge card day, and then the making up for lost time really begins. I hope that I’m ready for that, at least. This entry was posted in Injuries on April 1, 2011 by Kay. By the weekend, my latest injury was feeling considerably better. I took it out snowshoeing on Saturday, and the lure of the mountains overwhelmed me. I wrestled for most of the evening with the small voice of reason that told me I should give the injury more time to settle, and then threw my gear in a bag and set the alarm for 6am. I’m not a morning person and I normally have a hard enough time getting myself to work for 8.30am, but I love the ski day ritual. A bleary start in the dark, sipping coffee in the car as I wait for lights to change downtown, blue dawn seeping over the Sea to Sky. I must have driven that highway a hundred times now, but I will never get tired of it. I have to be honest: it wasn’t my finest day on skis. Conditions were hardpacked and icy, and I was tired from a week of short nights. I was favouring the right leg from concern over the LCL, and paranoia from the big spill last week led to me overtightening my knee brace on the left leg and irritating the hell out of the patellar tendon. Nonetheless, it was good to be there. I spent most of the morning cruising Harmony and Symphony, then made my way back to Dave Murray before lunch. Once again, it was the perfect run. Straightlining the top stretch, then carving at high speed all the way down Bear Paw to the deserted Garbanzo lift. I’m really focused on my carving at the moment; being limited to groomers is making me very conscious of the flaws in my technique, and it’s an opportunity to correct them. In the afternoon I headed over to Blackcomb and spent some time on Solar Coaster and Seventh Heaven before giving in to temptation and taking one run through Secret Bowl. The entrance was glorious – wind crust over a layer of soft powder – but Secret Chute was enormous bumps, which were a little too much for the bad leg to handle. It’s not missing much strength, but its response time lags fractionally behind the good leg and that’s enough to make gnarly bumps unmanageable. To my delight, I also discovered that Heavenly Basin had been groomed. The gorgeously steep run that resulted was a high point of the day. While I can’t ski off piste, I want my groomers to be as steep and challenging as possible. I wrapped up by riding back over to Whistler and blasting Dave Murray and Bear Paw as fast as I could. Under the warm afternoon sun, the lower third of the ski out had turned to wet cement. On the Shoguns I could have cruised over it, but on the Silencers I had to power through. My right leg started to ache like crazy, and I realized I might have overstretched the healing LCL. In the car every stretch of the foot to press a pedal made me wince. I arrived back in Vancouver with the sick feeling that I’d sacrificed the rest of my season to a day when I didn’t even ski particularly well. When I got up this morning, I could hardly walk. A physiotherapy session this evening reassured me considerably: the LCL is actually healing well, but I’ve got an underlying tear of the biceps femoris tendon and some strained calf muscles. Hopefully I haven’t ruled myself out of unlimited spring for a second year in a row. I’m not ready to be done with this yet. 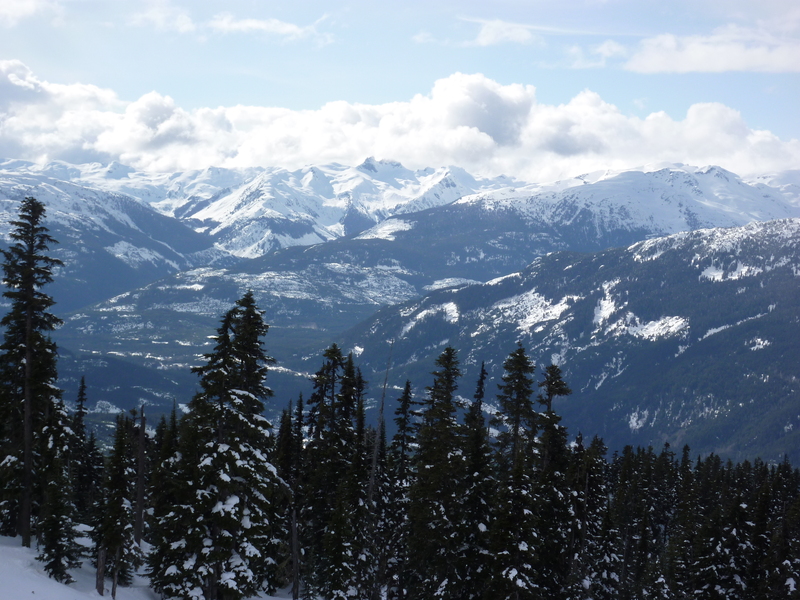 This entry was posted in Injuries, Skiing, Whistler Blackcomb on March 28, 2011 by Kay. On Friday I put myself back on the injury list, but only temporarily and right at the end of a day that couldn’t have been better in every other respect. We arrived on the mountain just as a bright morning sun was breaking through the clouds above the Emerald Express, and warmed up with a couple of easy runs before heading over to Blackcomb. The views from Peak to Peak were stunning: hazy clouds filtering the sunlight, and a dusting of fresh snow all the way to Fitzsimmons Creek. Every time I ski, I’m reminded of little things that I’d missed so much: the smooth sweep of skis on freshly-groomed corduroy, the epic vistas from the gondola, the anticipation of hanging between two massive mountains and knowing that all that terrain is yours for the taking. Over on Blackcomb we headed straight for Seventh Heaven. It was a perfect day for cruising groomers: no new snow overnight, but a full week of powder days packed solid underfoot. 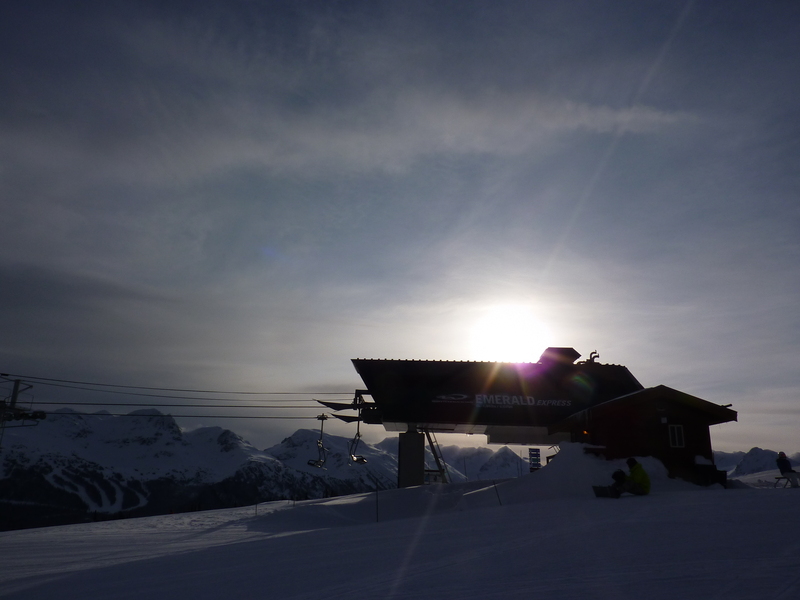 I’ve missed Seventh – hell, I’ve missed the whole of Blackcomb – like crazy, and the pitch of the gorgeous open runs was perfect for building confidence and speed. On Cloud 9 the wind burned my face and I remembered just how amazing it feels to let the skis straightline, building insane amounts of speed and power and driving it all into huge carving turns into the snow. After that the whole day was one high speed run after another. I couldn’t get enough of it, and couldn’t quite believe that not only my reconstructed knee but my whole out-of-ski-shape, unfamiliar body was able to rip so hard. Seventh, Springboard, Ross’s Gold, Ridge Runner, Dave Murray, Tokum – we found the longest groomers we could, and skied them as fast as we were able. I couldn’t stop smiling and on half the runs I was yelling with the sheer joy of it as we cruised into the lift line; I never imagined I’d be skiing like that on just my second day back at Whistler. The accident, when it happened, was a mixture of my own fault and freakish bad luck. We were on Dave Murray, catching a last few laps on Garbanzo before the lifts shut for the day. I was heading straight down when a skier shot out of a side trail and stopped dead directly in front of me. I swerved violently left to avoid him – no easy feat at the speed I was travelling – and realised as soon as the manoeuvre was complete that it had left me headed straight for my friend P, who was waiting at the side of the run. I flung myself back to the right but couldn’t quite clear him. My skis caught the very ends of his tails, catapulting me into a clean 180 spin. My right ski blew off on the ridge as I landed, giving my good knee a hard twist, then I crashed down onto my face and slid feet first about fifty yards down the hill. I knew immediately that I’d pulled something on the outside of the right knee, but I could also feel that it wasn’t a sharp pain and it wasn’t deep inside the knee where I’d felt my left ACL rip away a year ago. The first thing that went through my head was the LCL (lateral collateral ligament.) Then I got caught up thinking about the bad knee, checking that out and making sure the impact hadn’t caused any damage. It felt fine and even the right knee didn’t seem too bad, so I put my loose ski back on and went for a couple more glorious runs – not much slower than before – before the lifts closed down on us and we headed back to Creekside. That night things stiffened up badly, and while it didn’t hurt to walk or even to hop certain pivoting movements caused excruciating pain in the outside of the right knee. By this point I was pretty certain that I had a grade one or two tear of the LCL, and after it failed to improve on Saturday I took it to the doctor on Sunday. He confirmed my diagnosis, and advised a week of complete rest and then a week easing back into activities. No skiing for at least two weeks. I’m really bummed out that I just lost another two weeks of my already very limited ski season. At the same time, I’m grateful that this time I tore a collateral ligament that, unlike a cruciate, has the ability to heal by itself. And in some ways I’m relieved that the first fall is finally over and done. It was going to happen sooner or later, and now I no longer have that fear of how the knee will react hanging over me. I’m very happy that the bad knee survived the impact without damage (it tested rock solid), although I’m very aware that had it been the left ski that blew off and twisted the consequences could have been far more serious. Like the snowshoeing fall, this was a wake up call. I went for physiotherapy yesterday and the LCL injury is already starting to feel a little better. Now I’m doing my best to follow doctor’s orders, and counting down the days until I can head up to Whistler again. 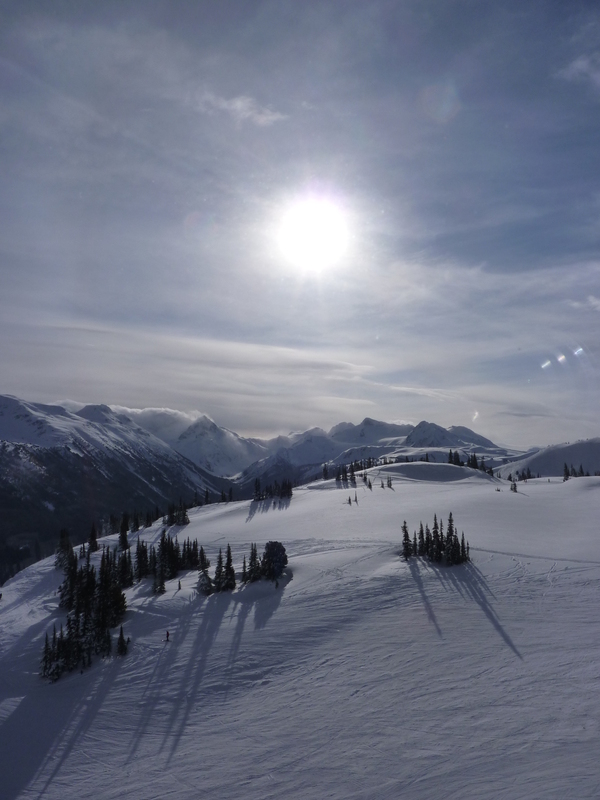 This entry was posted in Injuries, Skiing, Whistler Blackcomb on March 22, 2011 by Kay. Today marks seven months since surgery, and not quite a year since that day at Whistler when a moment’s inattention cost me my left ACL. Overall, I’m pretty happy with where I am right now. I’m surprised by how far away from normal my knee still feels, but am really glad that it’s stronger and more capable than it was. It’s holding up to exercise well, and the main thing that causes me trouble now is stiffening and soreness when I’ve been still for too long. I’ve had my three nervous, hesitant, wonky days on snow, and am coming to terms with the fact that this won’t be the season where I get back to skiing like I was before my injury. I am skiing, however, and that makes me very happy. The past seven months have been one long, steep learning curve. I had to develop a kind of patience that I’ve never known before and that will never come naturally. I took the longest break from work that I’ve had in my adult life. I discovered what it’s like to live with severe physical limitations. I gained a new appreciation for how lucky I am to have a partner as supportive and understanding as J, and learned what an amazing network of friends we have around us. As the time passed by my priorities shifted fundamentally, and I don’t think they’re ever going back. It’s been life-changing. Do I wish it hadn’t happened? Of course. I want those lost days back, the days of skiing soft snow under a spring sun, the glorious summer hikes, a thousand carefree moments that I spent instead trying to coax a stubborn, painful limb into bending just a degree or two further. Blood and sweat and tears. I wish it hadn’t happened, but I don’t regret the lessons I’ve learned because it did. This entry was posted in Injuries on February 9, 2011 by Kay. Day three was actually a week or so ago now. 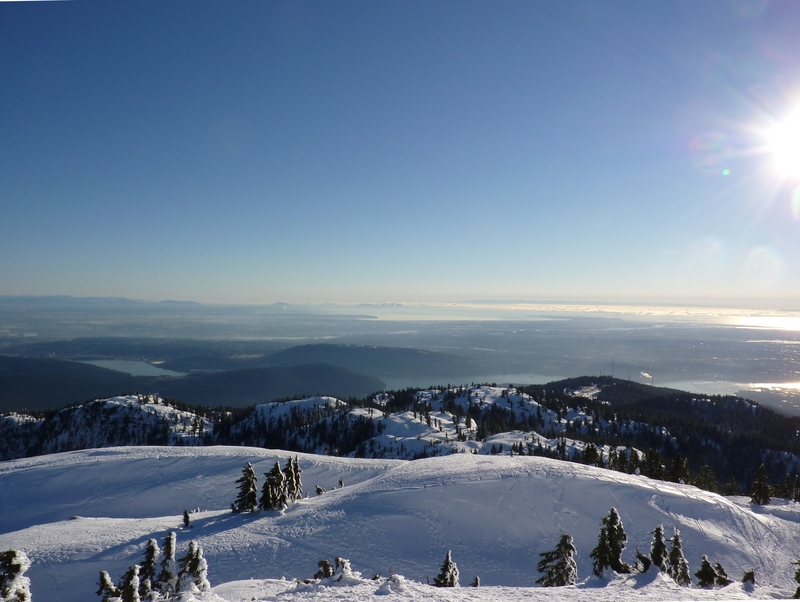 I went for a clean sweep of the North Shore and headed up to Grouse on a beautiful, freezing morning. I also made a clean sweep of terrible snow conditions: boilerplate at Seymour, wet cement at Cypress, and bomber ice at Grouse. At this point I’m still too happy to be back to care much, but it would be nice to test my legs on a slightly more forgiving surface at some point soon. For a La Nina winter, there hasn’t been a whole lot of new snow flying recently. Between the icy conditions and lingering muscle weakness I was skidding my turns for most of the morning. J’s teenage cousins joined me for a few runs shortly before lunch, and as the snow finally started to soften under a cloudless winter sky I stayed with them on The Cut and started to get some real carving in and work on my form. I know without looking that my body’s too rigid, I’m not getting enough hip movement into my turns and I’m still slipping into the back seat more often than I should. It’s like starting out the season with a brand-new left leg. A day or two later K text messaged me and asked when I’m going back to Whistler. There’s still progress to make before I’ll be ready, but it’s time to set a date and give myself something to work towards. I’ve been away far too long. 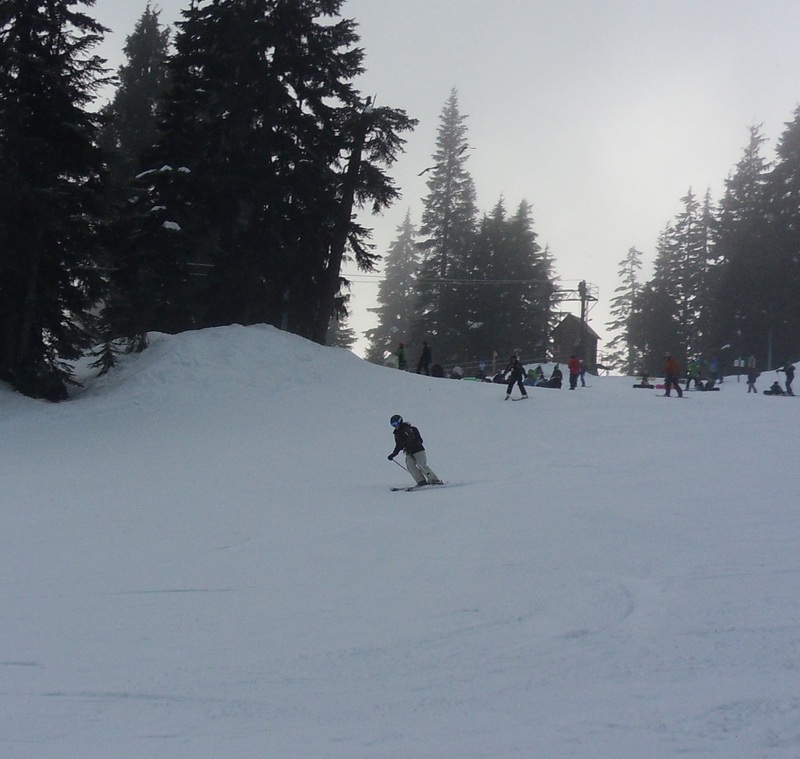 This entry was posted in Grouse Mountain, Injuries, Skiing on February 7, 2011 by Kay. Just before Christmas, GoWhistler posted on their Facebook page that they had a couple of free lift tickets to give away. They invited fans to post what they love most about Whistler, with the tickets going to the best comments. I dashed off a response – it’s not hard to think of things I love about Whistler, especially now while I’m missing it so much – and didn’t think any more of it. Today I got a message telling me I won a lift ticket. Somehow, this is the best thing that could possibly have happened. It made my day, and more than that. We’ve had such a hard, hard year this year; it hasn’t let up once since the moment I wrecked my knee and derailed everything we had planned. The good things have been very few and far between, and weighed down by all the bad crap surrounding them. But we’re almost done. One more day and we can close the door on this wretched year, and start over. In 2011 I’ll be skiing again, I’ll be climbing the Grind, I’ll be fit and healthy and whole. We’ll sort out the financial mess that 2010 has left behind, and move forward stronger for the hardships we’ve overcome. Somehow winning the lift ticket feels like a tide starting to turn. It seems so appropriate, coming at a time when I’m finally able to think about skiing again in the not-too-distant future. It’s been so far away for so long, but it’s finally close enough to seem real. Another month and I’ll be out there. The knee is feeling strong and stable; yesterday I climbed 500 floors in just over an hour on the Stairmaster, and today I cycled 100km in four and a half hours. I can run and I can jump. It’s been a long time coming, but I’m starting to believe that I’m going to be skiing again soon. This entry was posted in Injuries, Whistler Blackcomb on December 30, 2010 by Kay. The PFS flare that was making me so miserable in my last post lasted nearly three weeks. In the meantime I did what I could, maintaining a daily workout of around two hours with no impact at all. The swarm of angry hornets that had been trapped under my kneecaps buzzed and stung until last weekend, when we’d planned two snowshoe hikes. Getting ready for the first one, it was like someone had suddenly injected my knees with a magical antidote. We headed up to Grouse and stomped around in a snowstorm with a big gang of friends, diving into snowdrifts and somersaulting down slopes. My knee suddenly felt a hundred times better, although being side by side with skiers made me exceptionally sad. The next day I went up to Seymour with two friends, and led a hike that they later described as a “snowshoe death march.” I cannot begin to describe how good that felt: it never even occurred to me to slow down, because it never occurred to me that I could hike fast enough to cause anyone a problem. I probably should have been more considerate, but I was stoked when I realised that I’d set a pace that challenging. I felt like things were starting to get back on track. And then someone stole my bike. I know; it’s not the first time. But we’re pretty cautious based on previous experiences; we don’t leave our bikes in the parkade, which is completely insecure. We keep them chained to the stair railings outside our front door, right at the far corner of the top floor of the building and through two fire doors. When I opened the front door and saw the empty space I just felt utterly sick, especially as all of the medical and other expenses this year mean there’s absolutely no way to replace the bike. We work hard for what we have, and it’s never easy to know that someone believes they have the right to strip you of possessions that you treasure for their own selfish gain. But this was the bike that was my constant companion through rehab. It was the bike I rode to the beach at five weeks post-surgery, when my PT okayed me to go out on the road against all the odds. It was the bike that took me to work on my first day back. It kept me sane during the long months dealing with the aftermath of my knee injury. All thefts sting. Somehow, though, this one stings just a little bit more. This entry was posted in Biking, Injuries, Snowshoeing on December 27, 2010 by Kay.